This guide provides information on how to submit donor clinical data and how to interpret the validation rules/checks. donor_vital_status Donor's last known vital status. disease_status_last_followup Donor's last known disease status. donor_relapse_interval If the donor was clinically disease free following primary treatment, and then relapse or progression (for liquid tumours) occurred afterwards, then "donor_relapse_interval" is the length of the disease free interval (in days). donor_survival_time How long has the donor survived since primary diagnosis, in days. If source data was collected in months, use a multiplier value of '30.44' to convert values to days when preparing your submission. donor_interval_of_last_followup Interval from the primary diagnosis date to the last followup date, in days. ICGC requests that patients be followed up every 6 months while alive. If source data was collected in months, use a multiplier value of '30.44' to convert values to days when preparing your submission. donor_primary_treatment_interval Interval between primary diagnosis and primary treatment, in days. 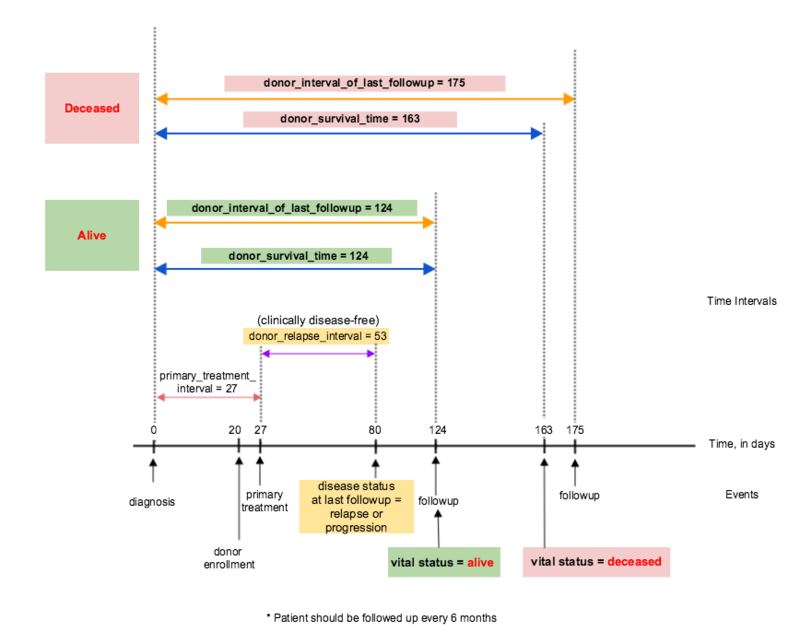 This diagram summarizes how the different donor clinical events relate to time. 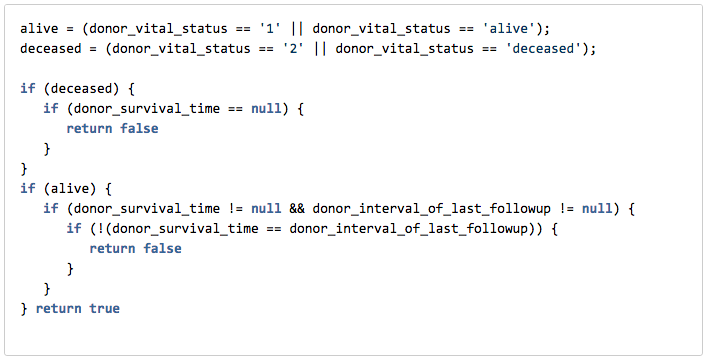 The field "donor_survival_time" is required. 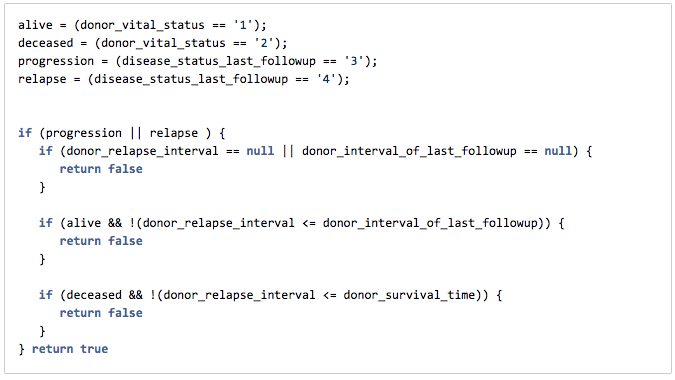 If "donor_survival_time" and "donor_interval_of_last_followup" have values, "donor_survival_time" must equal "donor_interval_of_last_followup"
The field "donor_relapse_interval" is required. "donor_relapse_interval" should be less than or equal to "donor_interval_of_last_followup"
"donor_relapse_interval" should be less then or equal to "donor_survival_time". The combination of the donor_primary_treatment_interval and donor_relapse_interval should be less than or equal to the donor's interval of last followup. If the donor is older than 90 years, default value of 90 should be used.